To mark the publication of their review of Meg Wolitzer’s much-hyped latest novel, The Female Persuasion, the editor of the New York Times Book Review tweeted a link to the piece, which was by Lena Dunham, and the following words: “Lena Dunham. Meg Wolitzer. Our work here is done.” Why exactly would the pairing of Lena Dunham and Meg Wolitzer mean that the work of the New York Times Book Review—and maybe feminism—is done? The tweet did not say. Neither did the review. “The conversation I’d been hearing around the book before I even received my galley was about its resonance within our current political climate, one that is so focused on issues of women’s consent, control and intersectionality,” Dunham wrote, leaving me to wonder what book she’d read. The novel that I read follows Greer Kadetsky, a young, white feminist whose journey to self-actualization begins in the mid-2000s on the campus of a small college which Wolitzer takes pains, for no obvious reason, to make her readers understand is not a great school. Greer is groped at a party by an oafish upperclassman, the administration does nothing, and Greer wants to fight back. Enter Faith Frank, a second-wave feminist icon in the model of Gloria Steinem and author of a manifesto called The Female Persuasion. She appears before Greer one snowy night at her college, blonde and wearing knee-high suede boots. A chance encounter in the restroom after that speech propels Greer into Faith’s orbit, later landing her a job at Loci, a venture-capital backed feminist organization founded by a man Faith slept with in the past. Wolitzer avoids overthinking the capitalistic underpinnings of Loci’s message by gesturing at it: Loci’s feminism is empowerment feminism, buffed to an expensive, soft-focus sheen. It’s the pop feminism of Men Explain Things to Me, which unwittingly spawned the rise of #mansplaining and pioneered the kind of softball aphorisms that the fictional Loci and various other real life organizations, such as Sheryl Sandberg’s LeanIn.org, traffic in to such great effect. Loci’s feminism is empowerment feminism, buffed to an expensive, soft-focus sheen. With The Female Persuasion, Wolitzer has taken a somewhat blinkered approach to solving the problems that come along with the plot I’ve just outlined. Control and its cousin, power, are what Faith says that women need to regain in order to assume the full complement of their abilities. The lack of consent and control—the former which serves as the narrative device—kicks Greer’s feminist journey into motion. Creating a fictionalized version of the campus sexual-assault pandemic and feminism’s rise to mainstream prominence is an ambitious task. After Greer is groped by Darren Tinzler, she realizes that other women on campus have been, too. In an attempt to bring this to the attention of the administration, they screen print some t-shirts with Tinzler’s face on them, wear them around campus for a while, and then this thread is discarded. In Wolitzer’s hands, sexual assault is the vehicle that brings Greer to a larger feminist awakening and hardly anything more. The audience for this book is perhaps one that feels alienated by the current cries for intersectionality and recognition for other perspectives in the feminist movement. To view the current wave of feminism through the eyes of a fictional millennial whose life is relatable enough to older women is one way to get through to this group. But to herald this book as the feminist tome we’ve all so desperately needed would be a bit of a stretch: Faith Frank’s concerns are the concerns of a specific generation who are currently struggling to adapt to a rapidly-changing cultural landscape. Greer’s starry-eyed optimism and devotion to her leader make her an appealing character for those who might select this novel for their book clubs or, upon finishing it in one weekend, feel the urge to discuss its themes with the millennial woman of their choice. The Female Persuasion is a perfect microcosm of the concerns of a very specific set of women who are grappling with the ways the conversation they began is changing. Greer is the kind of millennial that puts older people at ease: she’s smart and non-combative, and most importantly, she is completely enamored with Faith Frank’s feminist vision and feels empowered enough by her idol’s ideals to follow her to the ends of the earth—even if it means the potential destruction of her career. In Faith’s mind, mentorship is the driving force behind her feminism, and Greer is unusually up for being mentored. In such a relationship, it’s perhaps inevitable that differences of opinion shrink to the level of the personal, leaving the material of those differences mostly ignored. While the novel is very much about the anxieties and difficulties related to passing the torch from one generation to the next, Faith, not Greer, drives the story’s twists. She’s the reason Greer eventually becomes who she was meant to be. Other characters exist in the book mostly to support Greer’s journey. Zee Eisenstat, Greer’s best friend at the start of the novel, functions mostly as a vessel for the vast breadth of the queer experience and a gentle critique of the idealism among participants in Teach for America (which, I’m sorry to tell you, is called Teach and Reach in the novel). Then there’s Cory, Greer’s boyfriend from her hometown, whose life takes a drastic turn when he’s forced to move home and care for his mother after a tragic accident; at one point Cory finds himself cleaning houses for money, running his own household, and taking care of his mother like he would a child. These stories—which are also, by the way, about growing up—are not perfunctory, but they get short shrift to Greer’s feminist awakening. Wolitzer has built a kind of defense against criticism of the kind I’ve just articulated into the novel itself. Despite the obvious rifts between Faith’s brand of feminism and the moment that Greer is stepping into, there’s little to no pushback in the novel against Loci’s brand of empowerment-adjacent, wealthy, capitalist feminist agenda. Faith’s foundation, Loci, faces criticism, but in measured, easily-dismissed doses: “[P]eople were writing things on Twitter like #whiteladyfeminism and #richladies, and the hashtag that for some reason irritated Faith most, #fingersandwichfeminism.” This feels both shoehorned in as a corrective against any potential outcry and a rather blunt articulation of what the people using these hashtags might actually mean. Wolitzer’s willingness to engage with the anticipated blowback through these asides was a clever move, but because the characters are never taken to task beyond the deployment of buzzwords, it feels less like an meaningful discussion than insulation against critique about the novel’s failures of intersectionality. I’m always looking at my work and thinking, What did I do, what did I not do, what does the book need? But as always, I tried to take this book in the various directions that felt right for it, rather than trying for balance, because it’s a novel and not a comprehensive social study. Something I did try to do deliberately is portray the white feminist leaders in the book struggling to build a multi-racial movement. So the questions I hope readers will ask is why weren’t they successful? Where do good intentions and blind spots collide, in each and every one of us? What more can be done? 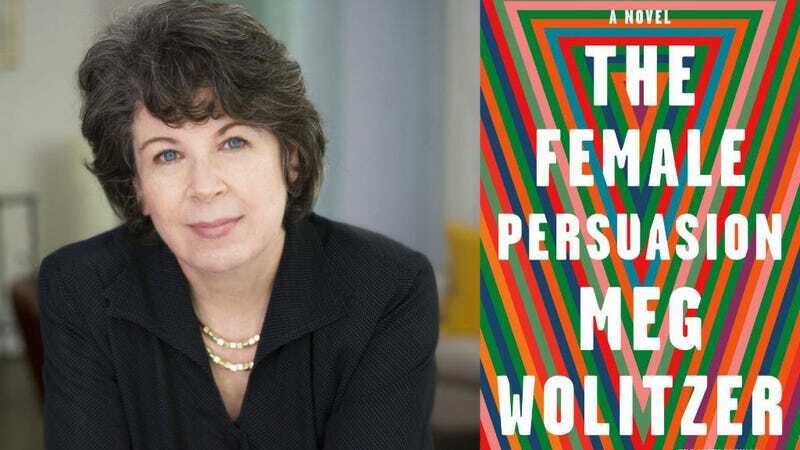 Knowing that Wolitzer was aware of her potential blind spots regarding intersectionality is reassuring, and it’s certainly fair to point out that The Female Persuasion is a novel, not a “comprehensive social study,” or even the fictional manifesto from which it takes its name, but the decision to center this story on generational struggle is telling. Feminism’s agenda evolves with every generation; what concerned second-wave feminists of Faith’s ilk are less important to the younger generation, who seek a more expansive and inclusive definition that allows for newer perspectives. Greer has assumed her place in the culture as Faith’s successor, she comes to a realization ripped less from the headlines than out of a fairy tale that Wolitzer articulates near the beginning: “We replace each other... that’s what we do; and we’re supposed to do it, over and over.” In the end, the novel suggests, it was right not to be too radical. Greer grows into the type of woman whom it’s easy to imagine smugly retweeting “Lena Dunham. Meg Wolitzer. Our work here is done.” It’s a shame Wolitzer didn’t give her the chance to be more.